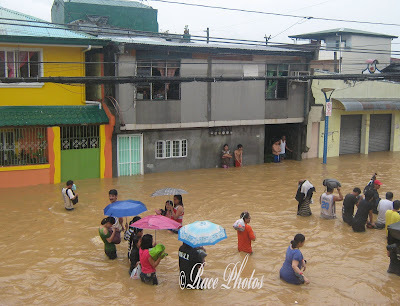 This is a shot from our veranda on the big flood caused by typhoon Ondoy that badly hit our town. Our town was submerged up to around 5 feet depending on the location or areas. This picture was taken when the flood started to decrease its height after one day of giving us deadly flood. We're lucky to have a two-storey house and we let some affected neighbors who have bungalow or one storey house stay in our place. One day after the flood stranded people started to come home and check their loved ones and homes including my sister and my husband. It was a saddening moment for those who lost the lives of loved ones and properties. It was MESSY all over the town after the flood subsided. It took days and weeks before the mess was cleared up With God's help we were able to move on and start anew. I love that they are using umbrellas. Gotta keep SOMETHING dry. I really feel for you all, though. Floods are no fun and I am sorry for the loss you all endured.